After her husband died, Ruth, a Moabite, moved in with Naomi, her mother-in-law. They were poor and living on leased land so they were using guile to survive. When it came time to harvest the grain, Naomi sent Ruth into the fields to help in the harvest. And it was there that Ruth was noticed by the land-owner, Boaz, who was immediately attracted to her. We know this because Boaz instructed his men to make sure Ruth was given light tasks and special favors as the people worked under the heat of the sun. Ruth did as she was instructed. 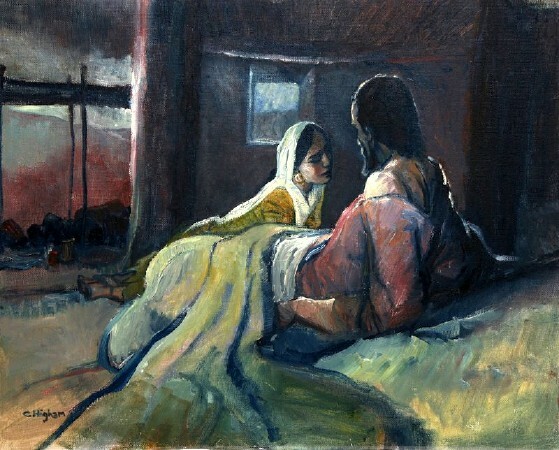 The moment she opened the blanket and laid at his feet, Boaz was awakened and he asked who was in his bed. She answered. He made sure she was covered and they slept together that night. It was after this that Boaz married Ruth. The Bible story carefully states that she laid at his feet. Hard line Bible thumpers would like to believe this is all that happened. But we all know that (1.) there already was a physical attraction shared between Boez and Ruth after they met in the grain field, and (2.) just crawling into bed and laying at a man’s feet in the night can quickly lead to much more. Some scholars suggest that the term “feet” can be easily translated as “legs” and if Ruth opened the blanket to lie over Boez’s legs, we can be sure that hanky-panky occurred that night. This explains why the encounter quickly led to a marriage.